Yamwood Foundry where visions become reality. Our mission is to turn a customer’s dream into reality. We build custom residential and commercial furniture with metal, wood, and passion. At Yamwood we combine the most advanced equipment and latest technology with good old-fashioned artisan skills. We work with customers through every step of the process from design to delivery and we pride ourselves on our ability to deliver one-of-a-kind, high quality pieces reflecting our customer’s style and taste. Openness to change and flexibility are instrumental in the success of The Yamwood Foundry. Some exciting things happen when you are adaptable. The nature of custom furniture means each piece is unique. From design to fabrication to finish, no two pieces are exactly alike. Being an expert, owning your piece of the process, and thinking “outside the box” are just some of the keys to success here. 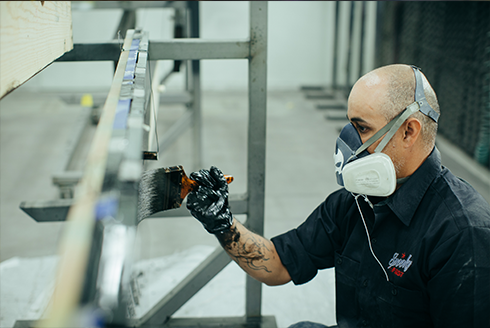 Sales, Design, Fabrication… no matter the position, creativity lives here. If you approach problems with an inventive mindset and you can share your innovative spirit with an excited client, then you might have a future at The Yamwood Foundry. We hire only the finest artisans so if you work here, it’s because you are among the best at what you do. At Yamwood, collaboration is the center of everything we do. We are team oriented and built on a strong family environment. Our culture and entire customer engagement process is predicated on teamwork and inclusion. From designing custom pieces, to sharing expertise to complete the job, to the delivery and installation, - we are focused on ensuring that everyone benefits from the power of collaboration. We take pride in what we do and we stand behind every piece we make. From inspiration to installation, we deliver quality. Every Time. Period. Each piece we create is a representation of our customer’s style and taste, and that’s not something we take lightly. We welcome a challenge and will stop at nothing to produce spectacular results. That’s our promise. As a Bob Parsons founded company, Yamwood Foundry is proud to offer our employees amazing benefits to manage their work life balance. Benefits begin the first of the month following 60 days of employment. We have an excellent benefits package that includes medical, dental, vision, life insurance, short term disability, long term disability, critical illness and accident insurance. 401K program with company match - free money always sounds good! Everyone needs a little rest now and then - why not get paid for it?! We offer a generous paid time off policy and paid holidays. Want to expand your knowledge and grow your career? We do to! We fully support you and offer paid training and professional development. We have some awesome employee discounts that kick in after only 30 days of employment. We offer competitive compensation and an amazing and fun work environment. Trust us, you’ll like your co-workers - everyone is here to work hard, play hard!